The initial draw for me to this issue was the price. The prospect of buying a new issue with no discounts at a bricks and mortar store for just over the $2 mark grabbed my interest out of principle (though I sheepishly admit to virtually ignoring all Johnny-DC books for the last couple years). It’s a first issue, it’s cheap, and it features characters I’m not terribly familiar with…so hey, might as well check it out, right? The first thing I noticed with the issue was the paper quality. Very thin, and if it isn’t, sure feels like the classic newsprint from comics of days gone by…which explains the cover price. The story is pretty simple and straight-forward: the Legionaires have conflicting views on what exactly it was that led to a young man of steel being part of their 31st-century team. We basically get several narratives from the characters, recounting a couple of quick adventures, collectively serving as a first-issue introduction-and-origin of the team and info about its starring characters. We’re given a look at the Legionaires "interviewing" the young man of steel to see that he’s eligible to join (this seems vaguely familiar to me as something from one of the original Legion of Super-Heroes stories from way-back-when); and then a fight with the Fatal Five. The art is also fairly simple and not terribly detailed (which is not to say there’s no detail), and somewhat manga-ish. I realize this is to have it fit with the actual cartoon this series is a companion to (though I’m not sure if the first episode’s aired yet). It’s not particularly my cup of tea so to speak, but it fits the tone of the book, the characters are distinct and recognizeable, and so I really can’t complain about it in and of itself. I’m not sure how this book will go over with long-time Legion of Super-Heroes fans, as my primary knowledge of the characters comes from the first year of the current iteration in the mainline DCU, but while this is definitely much different from that, I found it to be entertaining enough. I’m not a huge fan of the "Americanized-manga" styling, and a seemingly-on-the-surface over-simplification of things (the perception of which has largely kept out of the Teen Titans animated and Teen Titans Go! comic series). But as a simple, fun story not bogged down in continuity, this definitely isn’t bad. It’s also a self-contained "full" story, in a debut issue of a new series, that actually introduces the main/core team, gives a look at all the characters and interacts with them…which scores points in MY book. This is worth checking out if you’re looking (at least) for a quick diversion from all the heavy seriousness of many other current fare, and wouldn’t be a terrible issue to offer to the younger crowd–or read WITH them. Nothing all that spectacular, but certainly NOT bad at all. This issue, just by not being by Kunkel seems to lose some of its magic. It’s still a solid, fun issue…but for one thing, it felt like I just sped right throughout in about half the time it’s taken on previous issues. While I don’t have the prior issues onhand for immediate comparison, I think a large difference is in panel size and action–the panels seem larger than I remembered for this series, and far more open with less action…almost as if the previous issues were super-compressed compared to this issue’s “standard” sort of appearance. Billy and Mary battle a giant robot. That’s really the main plot here. Familiar elements are present–the kids’ living situation, Billy’s job, etc. The story’s fairly simple without being overly simplistic. The visual tone remains kid-friendly (as it should, given it’s part of the kids’ line). The art is also quite reminiscent of Kunkel’s…while the interior is not Kunkel’s, it does not seem all that far off from Kunkel’s cover image. If you’ve enjoyed this book thus far, this issue is a bit of a step down from what it was…but it’s still a good book, and much more enjoyable than a lot of fare out there. With Supergirl: Cosmic Adventures in the 8th Grade done with, I daresay this is my favorite of the Johnny-DC line. We do have a “To Be Continued” on this issue…but it seems more one of those ominous “Not the End” types, not so much a “the-hero’s-in-danger” cliffhanger. As such…this makes for a fine one-off issue….from introducing the main characters and their status quo, introducing the threat, dealing with the threat, and winding down on the action, you needn’t have read prior issues to enjoy this, nor does it make one anxious for the next issue. We open on a battle–Lex Luthor vs. Superman and Supergirl. Supergirl’s opposite/duplicate, Belinda has been taken out of the equation, and Supergirl’s secret identity’s best friend–Luthor’s younger sister–is fighting mad. Amidst the carnage, Streaky the super-cat and Comet the super-horse can be found fulfilling their own roles, as the true menace stands revealed as that 5th-dimensional imp-whose-name-is-hard-to-spell. As Supergirl and her future self attend to Mxy, we even get a couple of great nods toward mainline DC continuity that ought to elicit a knowing smile, at least, from older readers, and yet remain innocent enough that those not “in the know” won’t feel left out as the panels serve the story in and of themselves. This has been a great series–one that could have come across as overly simplistic, but has a strong balance of complexity with its simplicity. This issue draws on details sprinkled throughout the last 5 issues, building to a resolution that both wraps up the main points introduced without closing the door on the cast of characters. The art–as it’s been consistently on this book–has a simplicity to it that feels like this could be adapting an animated series, without feeling like there’s been any loss in quality for that. The visuals convey the story very well, and are an integral part of the feel of this book. The creative team has taken something that could have been a flop and created something much better than it had any right to be. If you passed on this or otherwise missed it as singles, I highly recommend checking out any collected volume that may become available…or track down the single issues, and share them with a younger reader in your life! This issue sees the culmination of elements from the first several issues come to a head as Billy and Mary confront Theo Adam with the help of the Wizard. Of course, it’s no easy task since the 7 Deadly Evils are along as part of Black Adam’s gang, and Captain Marvel is seemingly outnumbered. The art is at once an annoyance and a delight. It’s annoying because I’m not a fan of the exaggerations it embraces visually. At the same time, it’s a delight–it’s far from my usual preference, but this issue (and those before it) make me feel like I’m parked in front of a tv watching a fun cartoon. The story itself is fairly simplistic on the surface, but carries a lot of deeper stuff if one cares to look deeper. Like a well-crafted cartoon, there’s plenty to be enjoyed here even by adult readers, while holding what presumably would be attractive to the younger crowd. SUre, there’s violence, and sure, there’s fighting…but there’s no cussing, the violence is “cartoon violence” rather than “realistic,” and I daresay one would find much more enjoyment sharing this comic with them than a half hour on the couch with any of a number of contemporary cartoons. Most comics that I really enjoy migrate to the top of the stack when I sit down with new books. This one makes its way to the bottom–it’s a great “happy book” or “palate-cleanser,” and with all the little panels and dialogue and such takes awhile to read–a great ending to a stack of new comics that otherwise flash by far too quickly. 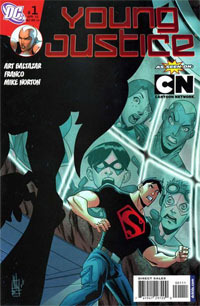 What gets this issue its rating is the overall enjoyment that transcends simply looking at the art or the story/writing. We begin this issue with an ominous scene of a student running from some clawed beast in the dark of the school’s halls, and then flip back to earlier in the day. We see that Kara is trying to solve her vulnerability-to-Kryptonite problem so that she could be of better use to her older cousin (visualized by a glimpse of her imaginary Moon Supergirl persona). Snapped back to other things she has to deal with, she inadvertantly exposes a cat to the Kryptonite she’s been working on. After Kara, Lena, and Belinda find themselves in a mostly empty school and begin to investigate, they come across a cat that seems to have Supergirl’s powers–and who they discover to have access to an underground lab where other students are being held. Amidst their tussel with the cat, Lena discovers Kara’s dual identity which puts a bit of a strain on their relationship. This is my favorite issue yet. We wouldn’t be to this point if we didn’t have the earlier issues, as they introduced us to characters and concepts that play roles in this issue’s story. But this issue was just so thoroughly enjoyable that I’m quite sad to realize there are only two issues left. If ever a mini-series should be updgraded to an ongoing, this is one of ’em! The art is strongly consistent with earlier issues–the primary characters are completely recognizeable, and the style of other smaller/newer characters fit in seamlessly with the established characters. The style puts me (as usual) very much in mind of contemporary animated series one might find on the Cartoon Network, while maintaining the feel of the intended media–this is a comic book, after all, and not a cartoon. The depiction of the cat is particularly amusing. The story–as said–builds on what’s already been established. 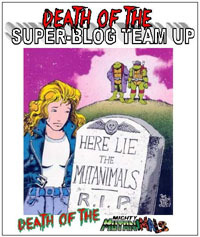 Though this is slated to be only a 6-issue mini-series, we have all the trappings of an ongoing series. Characters are changing and developing as we go along, with still loads of potential for continued growth beyond a mere two more issues. The story in this issue is at once self-contained and yet continues to develop over-arching themes. All in all, this is one of the most enjoyable comics I’ve read in a long time. Highly recommended!